and HERE for Beautiful Iris, a new release from IBS. I'm trying out a new-to-me challenge this week: Inkspirational, co-owned by my friend Ellen. Our design team at Inspired By Stamping is pairing with the DT from Inkspirational this month. IBS is sponsoring the prize. :-) This week's challenge is all about Shades of Green. For Christmas, I received a maple leaf punch and hadn't played with it yet. This was the perfect chance to create a fresh green wreath (well, freshly made of paper!). The sentiment is from Flowers Bloom by IBS. St. Patrick's Day is coming up, and it's a great chance to make a "Shades of Green" card if you're feeling inspired. Come play with us. 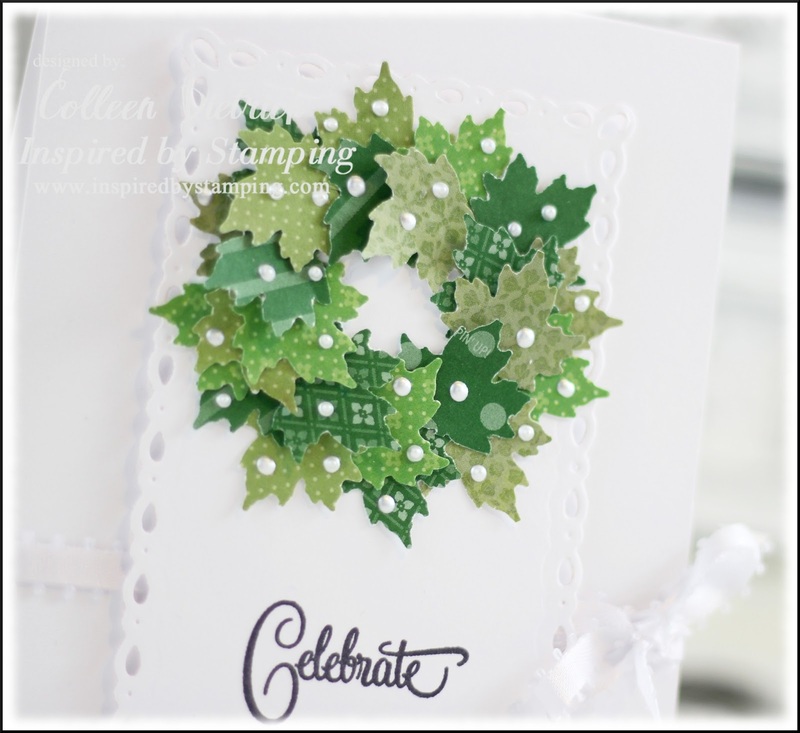 You could win the prize from Inspired By Stamping! This is gorgeous! I love love love that wreath!!!! Loved the idea of green wreath ! So very fresh Colleen! Love all of your sweet little patterned leaves! Gorgeous card...so fresh and clean. Hi Colleen! Your wreath is gorgeous!! I love the die cut you used. That is one of my favorites. Thanks so much for joining in with us at Inkspirational!! 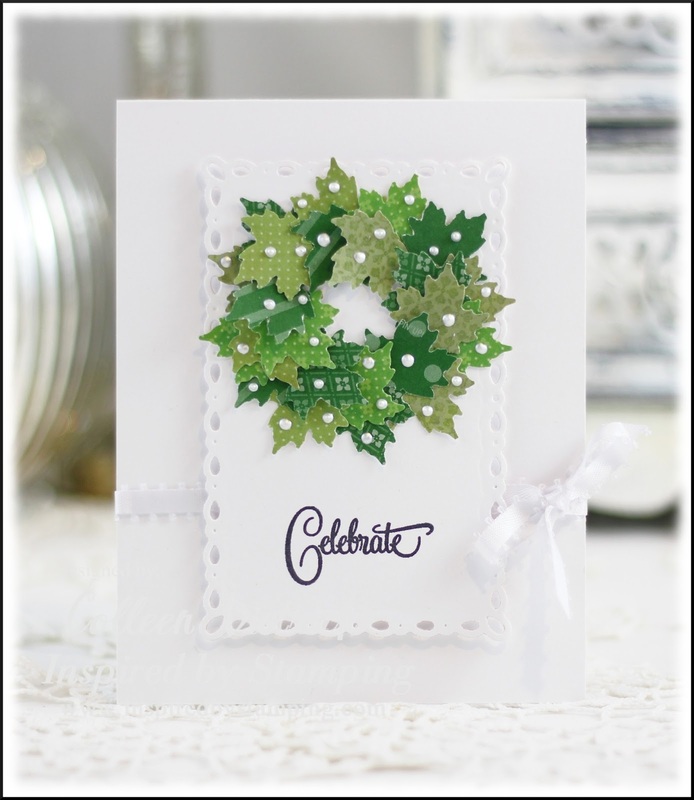 Love the shades of green on this card, does give it that fresh feeling! Lol sounds like a bad hygiene commercial. LOVE the different patterns of green on your wreath with the stark white background! FAB card, Colleen! What a fun way to make this wreath and it is sooooooooo pretty! I love it. What a pretty wreath, Colleen! So pretty in all that white space! What a fabulous ide - the leaves look so delicate and I love the pearls. You are one busy stamping girl, my friend! Love the sweet simplicity of this. The wreath is just wonderful!